Crete Accommodation for romantic getaways. Private, secluded retreats all over the beautiful island, take that special person away from it all. Take some quality time together, without distractions. Popping the question? Engagement? Anniversary? Wedding? Commitment Ceremony? Or just a good old-fashioned romantic holiday? We can help with our suggestions for beautiful surroundings in Crete ideal for couples. Lavender Cottage - oooh sooo romantic! Are you listening, guys, this is what we girls find romantic! If you want a happy life and happy wife, fiancé or girlfriend, consider this delightful, dreamy cottage for your next surprise tryst. Villa Petra is just outside a little hamlet yet close to Chania and to beaches. This homely, cozy, yet stylish villa is totally private and peaceful, surrounded by olive groves. With high ceilings, air-conditioning, an open-plan kitchen and dining area, private terrace, gracefully sloping gardens and pool, and a large bedroom, this villa has everything for relaxation and romance. 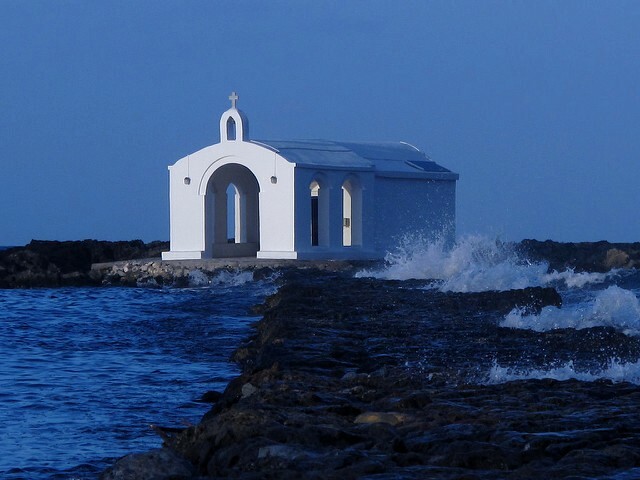 Close to Georgioupolis Beach with its lovely chapel (see below). Barozzi Suite is a cozy couple's retreat in a stylishly renovated 14th Century stone mansion, complete with jacuzzi, terrace and pool. 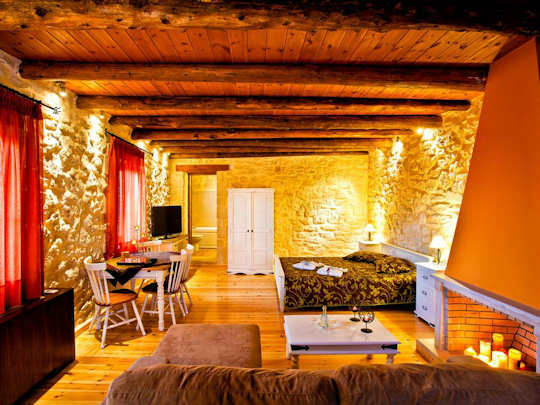 Find complete privacy here in Agiroupolis traditional village set back in the hills. The cool waters of the numerous waterfalls of this village make it an oasis in summer, just 7 km from the beach. 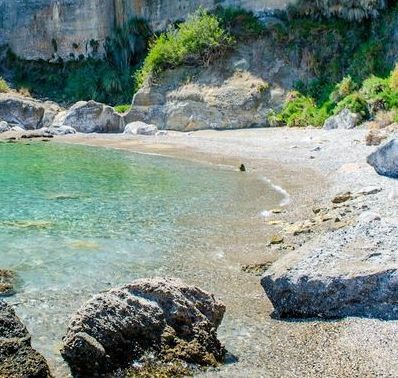 Matala Caves Seafront Apartments are ideal for romance for fun-loving couples, as the studio is right above the tavernas of this little seaside village. Enjoy the colours on the water, the reflections on the cliffs and caves and the sweeping panorama of this dramatic bay. 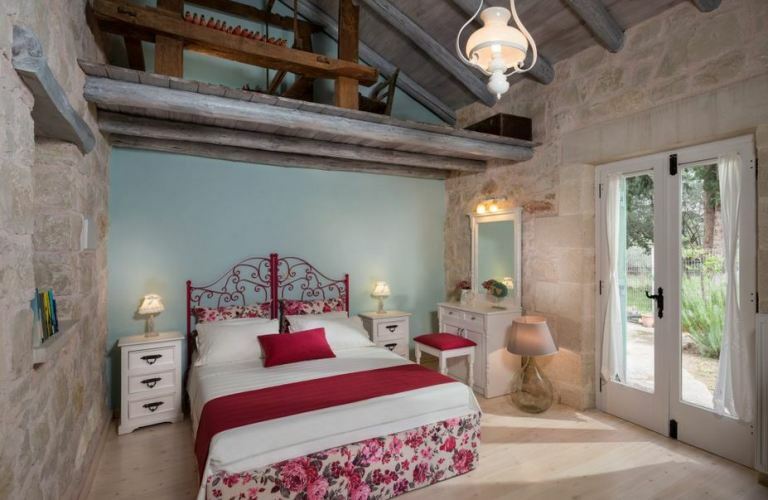 This recently restored 1 bedroom studio has 1 bathroom and cozy bedroom with natural stone and traditional construction and modern, rustic design features. Enjoy outdoor living on the large patio with an expansive vibe. Cheers! Crete Accommodation - when we say beachside, we mean directly on the beach. 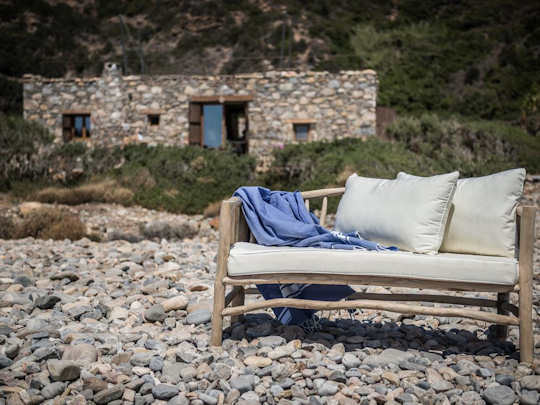 The Old Beach House is our top choice for a secluded couple's retreat in Crete. A remote, little known cove. A funky beach shack. Direct beach frontage. A pool and air conditioning. Privacy, space, tranquillity. Carob Villa has its own private beach. ...or explore the tavernas, restaurants and cafe bars of south-eastern Crete together, visit myriad sandy shores including Chrissi Island. 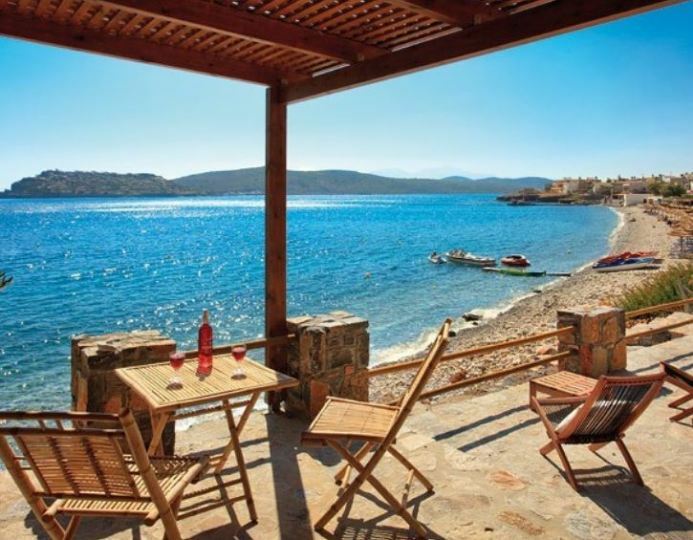 Plaka Seaside Cottages sit directly on Elounda Bay just a few footsteps from the sand and pebble beach. Located a few hundred metres from the tiny hamlet of Plaka, you will have the best of both worlds. Privacy and seclusion on your own private beach (shared with two other cottages), and tavernas with fresh seafood and a convivial atmosphere just a minute's stroll away. Crete Accommodation - Get some peace and quiet in style in some of the most luxurious accommodation in Crete, in a peaceful, child-free environment, designed for couples. Minimum ages at each resort vary, so please check with the hotel directly. 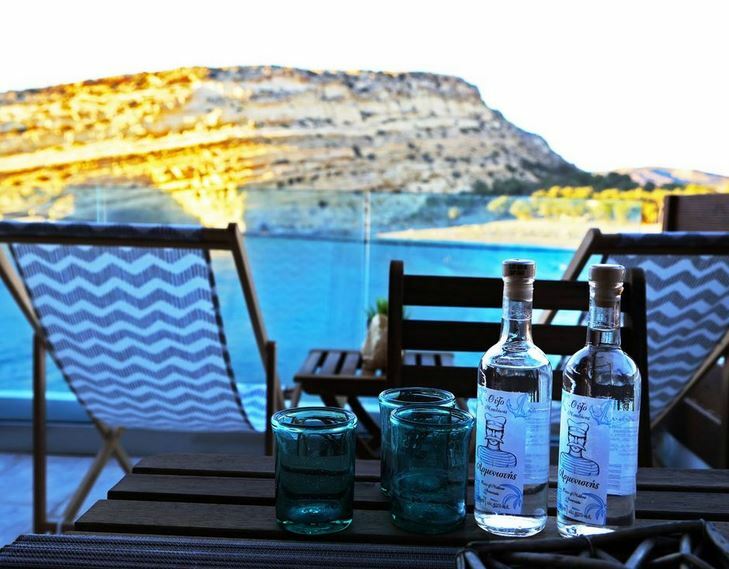 Aquila Elounda Village is on the beautiful bay of Elounda a few miles from Agios Nikolaos. This is a large resort with multiple facilities and room types, pools, pool bars and beach. You won't be alone but you can chill out and experience all the luxuries in life. The rooms with their own dipping pool are ideal for couples. Thalassa Beach Resort specialises in romantic retreats for couples. Take advantage of the beachfront fine dining, double sun loungers and spa treatments for two. Add healthy or unhealthy treats; yoga or champagne, chocolate or tango lessons, red wine or candles and flowers in your room. 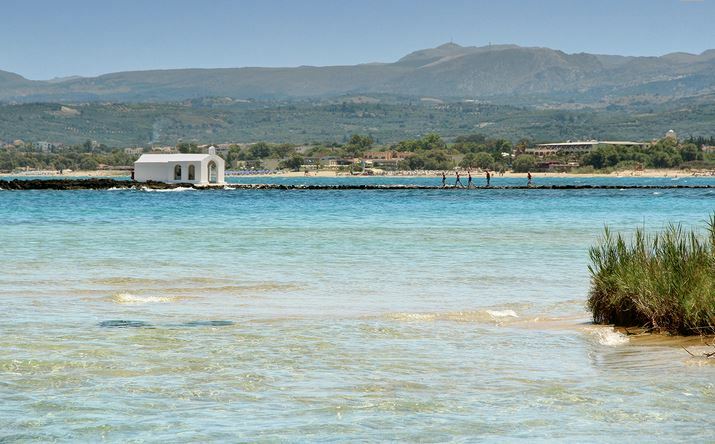 Make it memorable, enjoy this beautiful beachside property close to Chania. 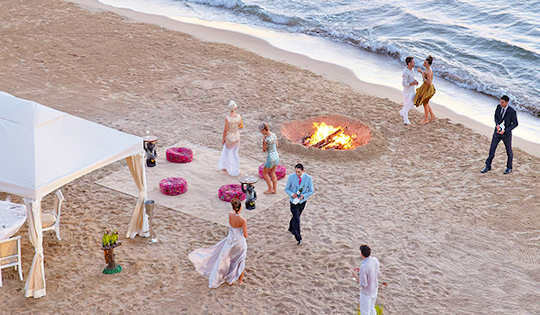 Crete Accommodation - plan for a ceremony by the beach at the magnificent luxury resort Caramel by Grecotel. 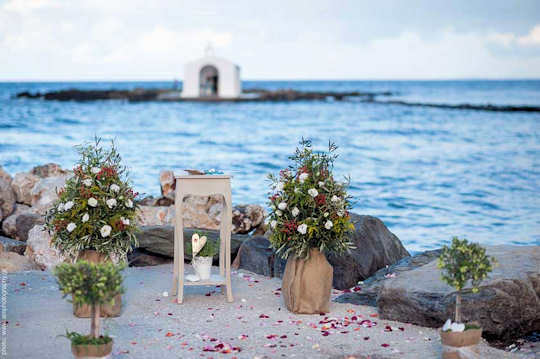 Located just 6 km from the atmospheric historic laneways of the Old Venetian Town of Rethymnon, this beachside experience will accommodate all your needs and guests for your special ceremony. Caramel by Grecotel is a sublime resort for romance in Crete. 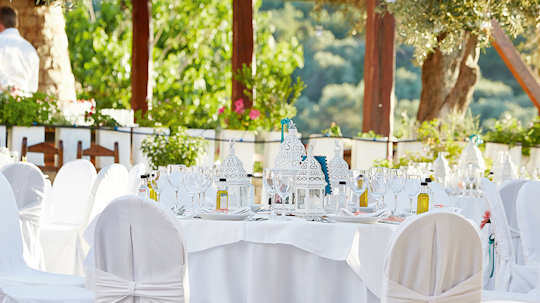 Arrange your ceremony by the beach or at the organic farm with a traditional Cretan taverna experience. Arrange your pre-party or reception party here on the beach with private dining and your own carefully prepared menu. Nothing is too much trouble for this expert team to prepare. 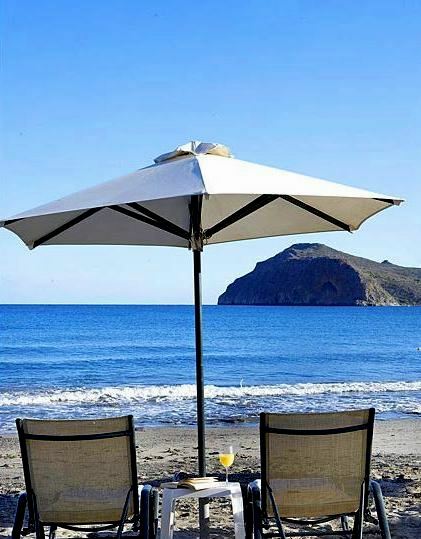 Allow Crete to be the backdrop for your special occasion. Allow Crete for Love experts to create the most memorable ceremony of your life. 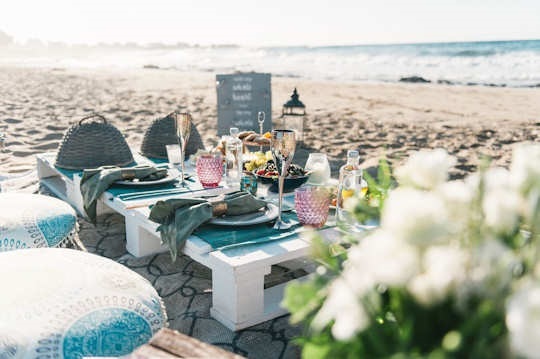 Whether it is an engagement picnic, a family celebration, a symbolic union ceremony or indeed a full Mama Mia wedding party, the creative team at Crete for Love are up for the challenge. Do you feel like an escape in nature? 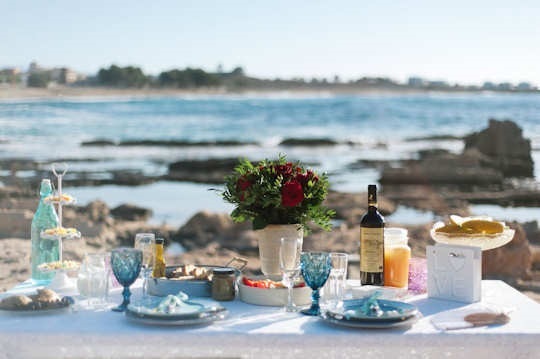 Perhaps asking that special someone an important question on a beach picnic - see above - or in a leafy vineyard? On top of a mountain? Any dream you can dream, Anna and Stavriani will be able to support you with their knowledge of the island and their unique creative flair. Georgioupolis (pictured above) would be a lovely location for your special ceremony, your party event and for ammodation for your family and friends. The village has lots of options of hotels and apartments, and a lovely long, wide, sandy beach. This village is located mid-way between Chania town and Rethymnon town. 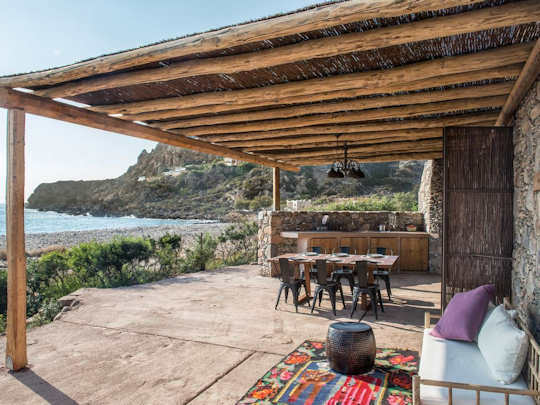 Villa Petra (featured above) is close to this beach and would make a perfect Crete accommodation for your romantic holiday.